Legislative Update by State Representative Tom Taylor. Introduction of Dunwoody High School Principal Priscilla Cole. Introduction of Dunwoody High School Youth Council. Recognition of Officer of the 3rd Quarter: Joshua Sanders and Employee of the 3rd Quarter: Liz Stell. Resolution Authorizing a Merit Increase for the City Clerk. Updated Salary Chart. Resolution Authorizing Third Amendment to the City Manager's Employment Contract. Resolution to Approve the 2018 Annual Operating and Capital Budgets. Resolution Appointing a Member to Serve on the Volunteer Coordinating Committee. Presentation of Convention and Visitors Bureau of Dunwoody 2018 Budget. Discussion of 2018 State Legislative Priorities. 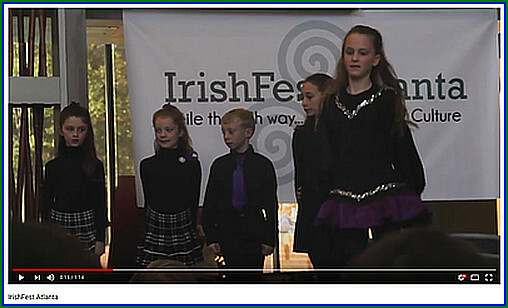 Great event for the entire family - kids of all ages! Find giggles and surprises around every corner as Boy Scout Troop 477 takes you on an interactive tour back in time to the 20th Century and brings history to life through guided time travel! Meet historical figures from the last century and follow some of the most incredible advancements in transportation, communications, and entertainment. 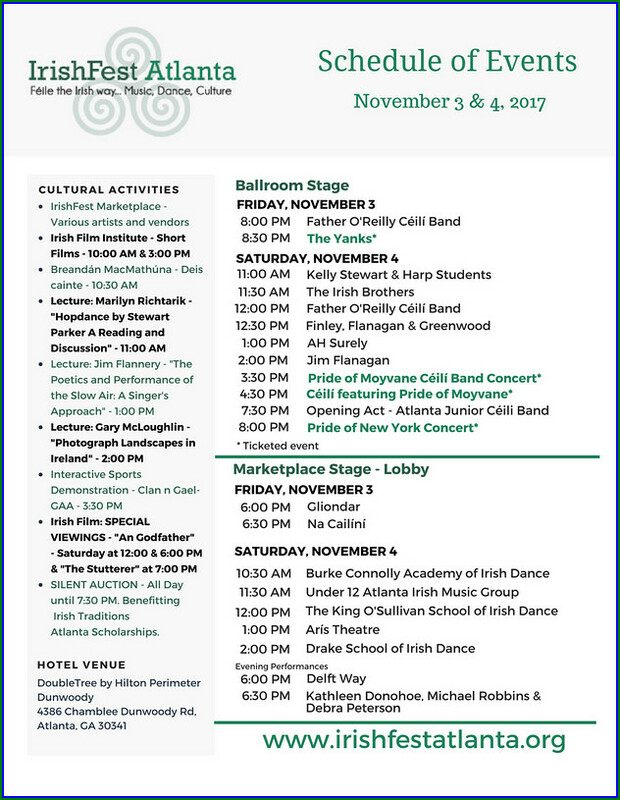 Enjoy a whole day of games, crafts, music, s’mores, yummy snacks and a food court. 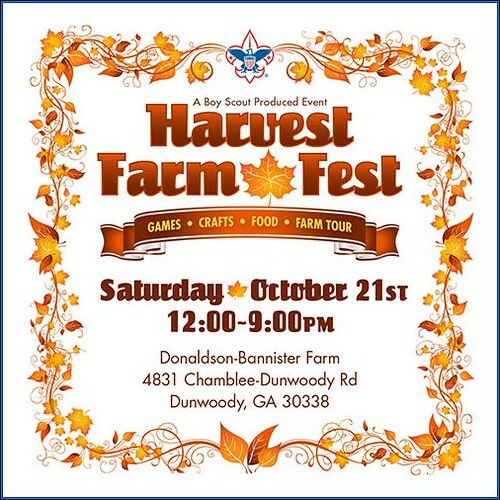 Don't miss Dunwoody's favorite fall tradition. After 42 years at Dunwoody Park, DSB is moving to our new home at Peachtree Charter Middle School after the 2017 Fall Rec Ball season. 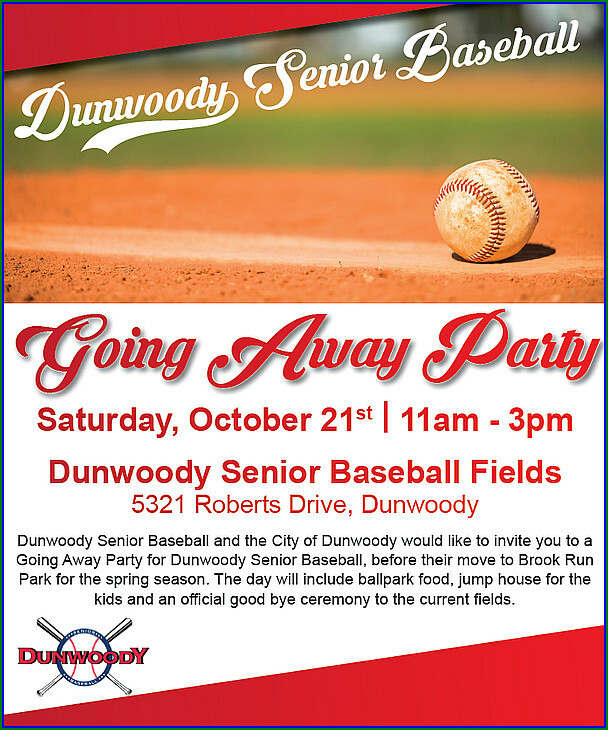 Join us as we celebrate the success of our program and say Thank You and Goodbye to Dunwoody Park. 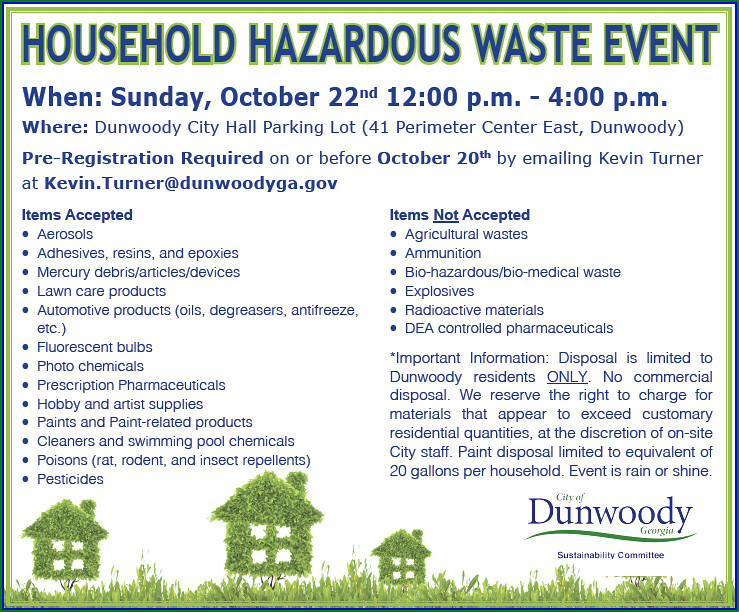 Dunwoody Household Hazardous Waste Event - Sunday Oct 22nd from Noon to 4 at City Hall. 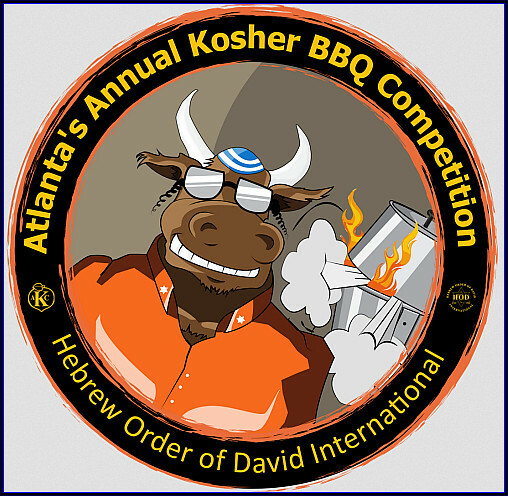 Atlanta's PREMIER Kosher BBQ Festival returns for its 5th year BIGGER and BETTER! Join families, BBQ enthusiasts and festival goers for a fun filled day of finger lickin' BBQ, cold refreshments, live music, an energetic Kids' Zone and more! Don’t miss the culinary creations of over 20 BBQ teams competing for the big prize judged by official Kansas City BBQ judges! Come judge for yourself who is serving the BEST Kosher BBQ. This community festival is presented by the Hebrew Order of David International and features its famous Kansas City Style BBQ Competition (under AKC kosher supervision). This year, various Kosher vendors will sell tasty plates and desserts as well. The Hebrew Order of David Foundation Inc. is a 501(c)3 charitable organization that helps serve the community. Profits from this event support various community entities such as Cobb County K-9 Unit, I Care Atlanta, Jewish Homelife Communities and Weinstein Hospice. 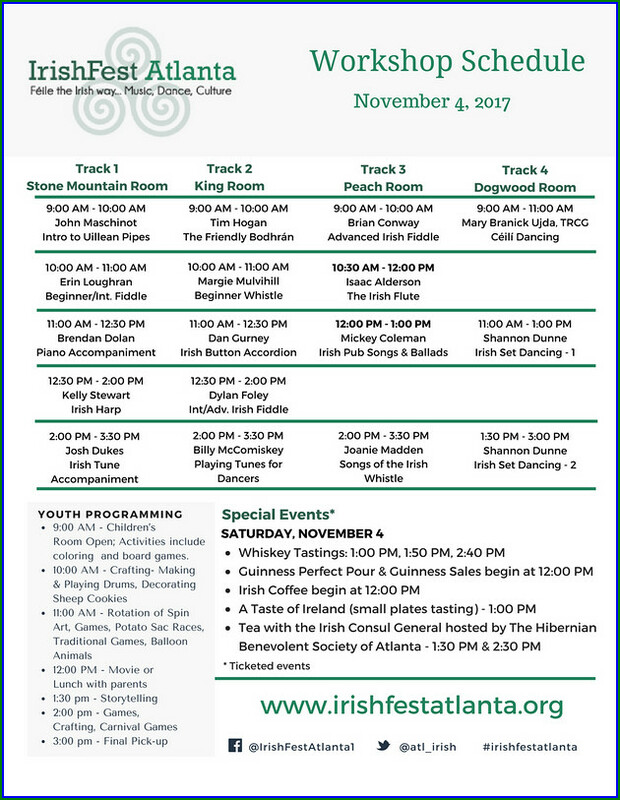 Lots of kids activities at the Sunburst Kids Zone and outstanding music provided by the Atlanta Jewish Music Festival. • Local Charities will benefit from event proceeds. We will be serving AKC Kosher BBQ Brisket Sandwiches, Hamburgers and Hot Dogs during the entire event as well. The folks from the Big Green Egg will be cooking and selling amazing CHICKEN THIGHS AND ROASTED CORN that will blow you away. For more information and to purchase discounted tasting tickets visit: https://theatlantakosherbbq.com/. The Dunwoody Homeowners’ Association and The Crier are sponsoring candidate forums for the three Dunwoody city council posts up for election on November 7. 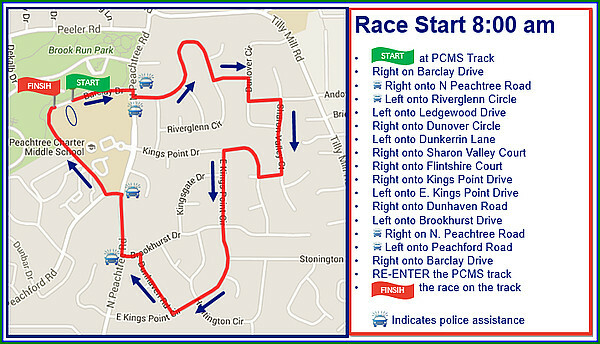 The question and answer format will take place Sunday, October 15 at Kingsley Swim/Tennis off North Peachtree Rd. 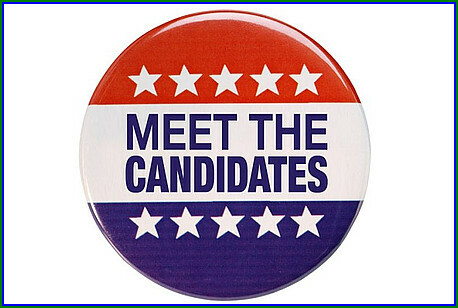 Candidate forum for three "local" city council posts. Nice article highlighting the candidates is linked below. 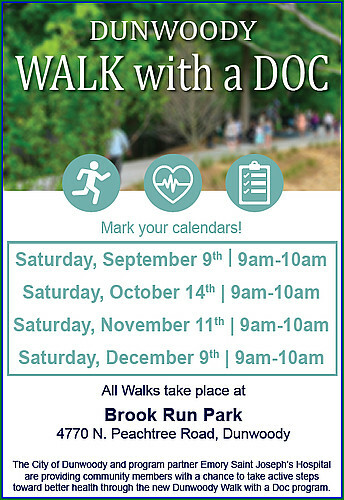 City of Dunwoody & Emory Saint Joseph's Hospital sponsors Walk with a Doc - this Saturday. 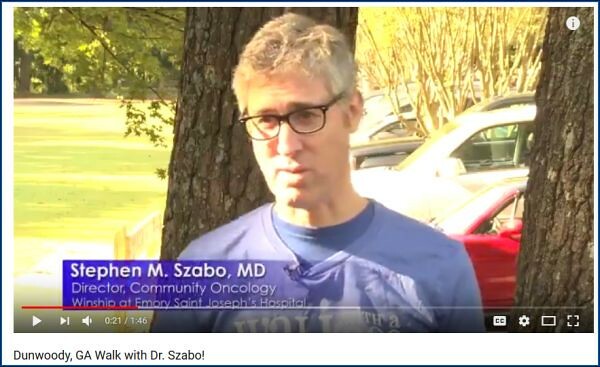 Working with program partner Emory Saint Joseph's Hospital, the city offers community members a chance to take active steps toward better health through the new Dunwoody Walk with a Doc program. The next Walk with a Doc event will take place on Saturday, October 14th at Brook Run Park (4770 N. Peachtree Rd, Dunwoody) on the front field, opposite the playground from 9:00 a.m. to 10:00 a.m. Dr. Elizabeth Shaw – otolaryngologist with ENT of GA will be educating the community on the management of fall allergy symptoms. Pre-registration is not required and the FREE Walk with a Doc monthly exercise and education initiative is focused on getting participants active in a Dunwoody park while conferring with a healthcare professional host who can provide support to walkers and answer questions during the walk. No voting at Dunwoody High School on Nov 7th (or anytime in the future). The DeKalb County Board of Registration and Elections (R&E Board) hereby gives notice to the voters of DeKalb County of the following proposed polling place changes will be effective for the November 7th Municipal/Special Elections and all subsequent elections. 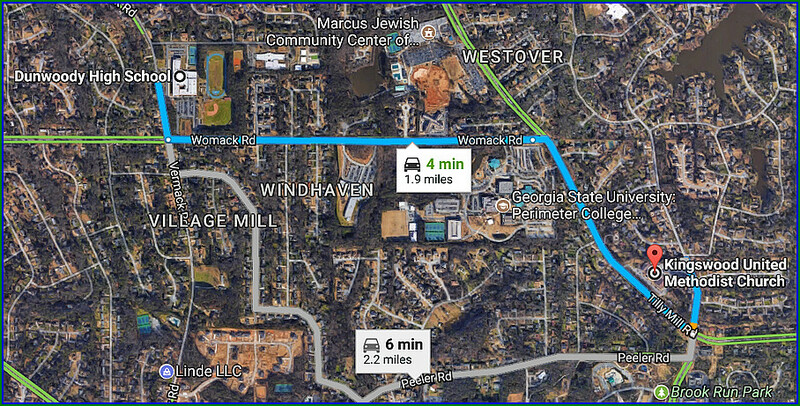 The polling place for the Dunwoody High precinct will be relocated from Dunwoody High School to Kingswood United Methodist Church, located at 5015 Tilly Mill Road, Dunwoody, 30338. This change is proposed because the DeKalb Board of Education has notified the R&E Board that Dunwoody High is no longer available. 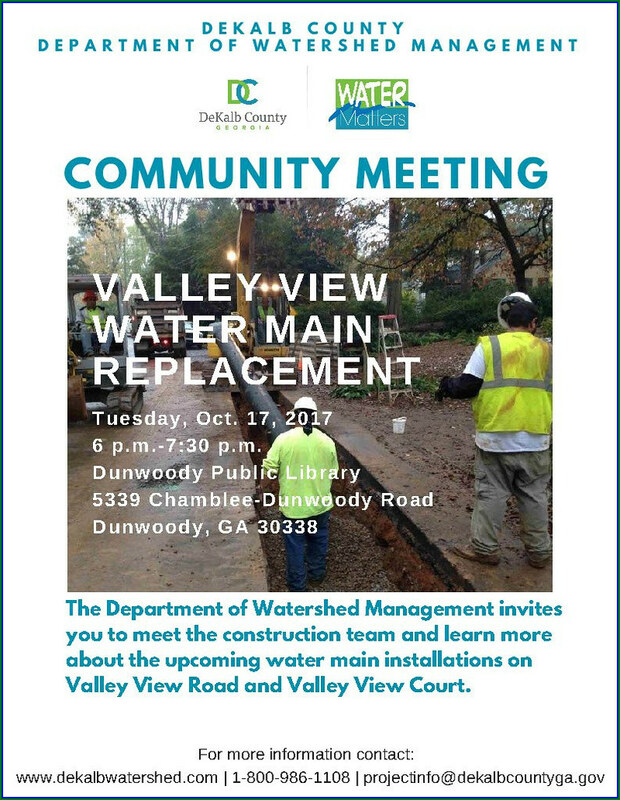 The City of Dunwoody has requested that early voting be made available a week prior to all actual elections at the Dunwoody Library (for a small cost to the city) and the DeKalb Board of Elections will be deciding on that request on October 12th. Ken is "Straight out of Dunwoody"
Having served as my first mayor on the Dunwoody City Council, I have nothing but great admiration and respect for Ken Wright!! The Dunwoody Crier is reporting that Ken has decided to run for the State Legislature and I know first hand the work he put forward down in the Gold Dome to make the City possible therefore I am very happy to hear the news. 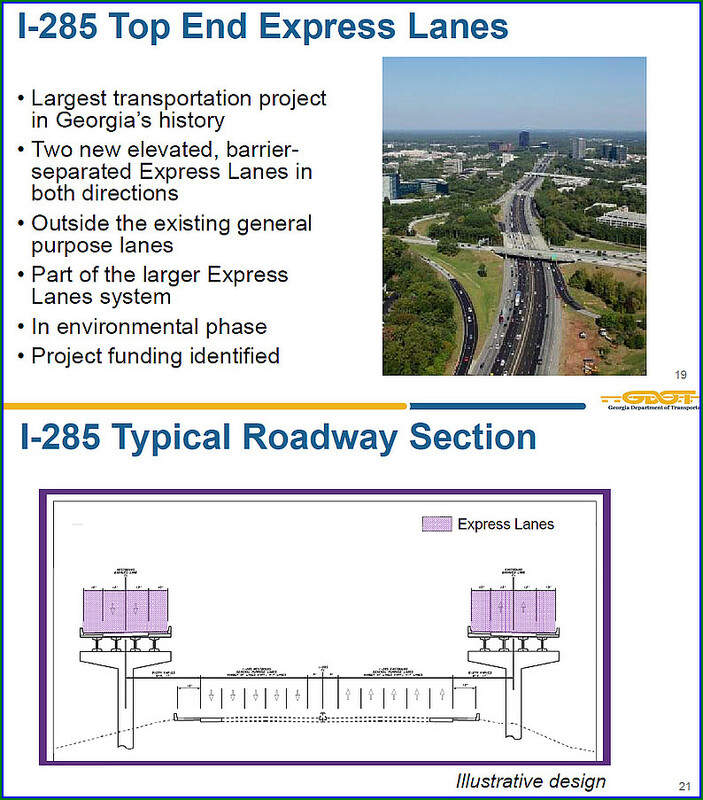 Presentation by Georgia DOT on the I-285 Managed Lane Project. Update on Vermack/Womack Intersection Improvements. SECOND READ: SLUP 17-03: Jessica Hill of MMM Law, Attorney for Trammell Crow Company, the Applicant for a Portion of 1134 Hammond Road (Tax Parcel ID 18 348 01 020) and 4400 Ashford Dunwoody Drive, Dunwoody, GA 30346 (Tax Parcel ID 18 348 01 006), Seeks a Special Land Use Permit per Chapter 27, Section 27-73(b) to Increase the Building Height in a C-1 (Local Commercial) District from 2 Stories/35 Feet to a 16 Story Office Building and 10 Story Hotel. MA 17-01: Laurel David, Attorney for RB 84 PC, LLC, Owner of 84, 130, and 140 Perimeter Center East, Seeks to Modify Previous Zoning Conditions. The tax parcel IDs are 18 347 01 013, 021, and 028. SECOND READ: Ordinance Amending Chapter 16, Land Development, Regulations, Article II, Environment and Natural Resources, Division 6, Tree Preservation. Approval of Municipal Pole Attachment Agreement Between the City of Dunwoody and AT&T. GDOT is coming to Dunwoody City Council meeting on Monday to discuss Revive 285 project and possible raised express lanes. Full GDOT Presentation and meeting starts at 6 PM Monday at City Hall. Brook Run Park - 8:30 this evening. We are all stunned by the horrific tragedy unfolding in Las Vegas last night and today. In response and solidarity, we have secured a permit to have a candlelight vigil in Brook Run Park (the front field) starting at 8:30 (Tuesday, October 3rd) night. The vigil will last no more than a half an hour. There will be no protests, or speakers, just a chance for our community to come together in grief. Please invite your family, friends and anyone else who wants to feel the warmth of our community at this terrible time. Feel free to share on Social Media! The Atlanta Warbird Weekend (AWW) is an annual event dedicated to the remembrance and celebration of the men, women and machines of The Greatest Generation. In metro Atlanta, there are significant historical resources and AWW is the catalyst to bring together the organizations, aircraft and people that keep this history alive and engage families and businesses that want to keep this spirit alive. will honor and salute the Tuskegee Airmen. The Tuskegee Airmen, the first cadet graduates to earn their wings 75 years ago at Tuskegee-- becoming the first black U. S. Army Air Corps pilots, have a rich history that begins in WWII but reaches far beyond those confines. In conjunction with the celebration of the accomplishments of the Tuskegee Airmen, the weekend will also place a focus on the accomplishments of all African-American pilots from WWII to the present. The Commemorative Air Force Dixie Wing will assemble at Dekalb-Peachtree Airport all the type of airplanes flown by the Tuskegee Airmen. Along with other famous aircraft such as a FG-1D Corsair, SBD-5 Dauntless dive bomber, T-6 Texan, C-46, Stearman bi-planes, Douglas DC-3 and after four years a B-17 Flying Fortress will offer rides and cockpit tours. Meet WWII Veterans and noted authors, attend a WWII 8th Air Force Fighter Mission Briefing, enjoy 1940’s Hollywood entertainers, visit with WWII reenactors, participate in a photography workshop and attend a dinner symposium with the original Tuskegee Airmen at the 57th Fighter Group restaurant on Saturday evening. Atlanta Warbird Weekend is a two-day WWII Warbird Rides Event. The weekend holds more than just aircraft rides and cockpit tours. Immerse yourself in the WWII era with historical reenactors, military equipment displays, live 1940’s era music, museum collections, bomber turret displays, meet “Pin-up” girls and get your “smooched” calendars, Warbirds in Review – hear how these rare aircraft defended democracy, book authors and meet members of the Greatest Generation – pilots, gunners, crewman and more! 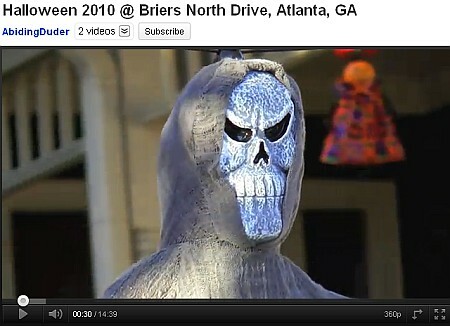 The Atlanta Warbird Weekend IS NOT an Air show. Warbird rides Sat & Sun 9:00am - 6:00pm - Click HERE to buy your ride! B-17 rides Thursday, Friday, Saturday and Sunday 9:00am - 6:00pm - Click HERE to buy your ride! Dinner with the Tuskegee Airmen, Saturday 7:00pm - Click HERE to book you ticket! Sunrise Aviation Photography Session - Click HERE to book you ticket! The city has coordinated with DeKalb Sanitation to host two recycle bin trade-in events here in Dunwoody on October 14 and on October 22. 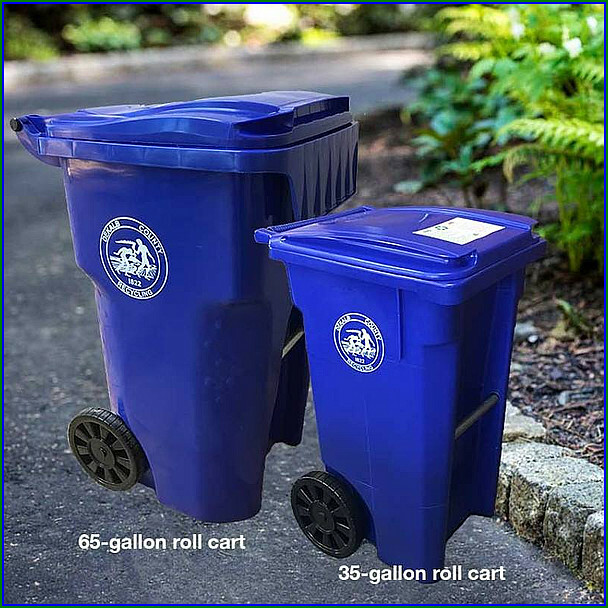 DeKalb County Sanitation Division is requiring residents to switch to a new standard 35-gallon recycle roll cart (or an upgraded 65-gallon recycle roll cart) to replace the existing 18-gallon bins and 40-gallon bags as part of the residential single-stream recycling program. Existing subscribers with 18-gallon bins must trade them in by April 30, 2018, for a complimentary 35-gallon roll cart or, for a $15 fee, subscribers can choose a 65-gallon roll cart. Existing subscribers must trade in/return the 18-gallon recycling bin prior to obtaining the complimentary 35-gallon roll cart or the 65-gallon roll cart. The City of Dunwoody has coordinated with DeKalb Sanitation to offer two bin trade-in events in Dunwoody. 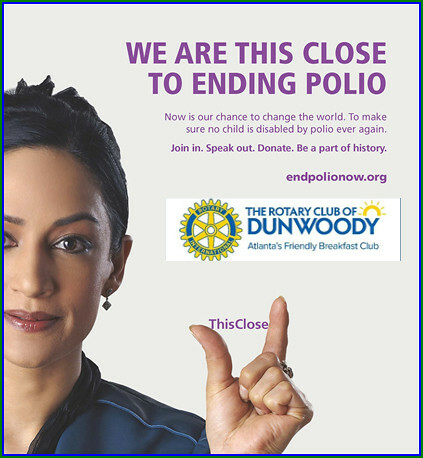 To register for a Dunwoody bin trade-in event please visit the Parks Registration Portal ( https://secure.rec1.com/GA/dunwoody-ga/catalog ). Select the 'DeKalb Sanitation Recycle Bin Trade-in' event tab and then select the event you would like to attend to make your trade-in. You will need to create an account with the Parks Registration Portal. After “Checkout” is complete please View/Print the residential curbside single-stream recycling subscription form and bring that along with cash or check (if you choose to upgrade to the 65-gallon roll cart it will cost $15) to your selected event and DeKalb County Sanitation will handle the swap. Participants will need to bring in a completed residential curbside single-stream recycling subscription form. The completed form must be presented along with an existing 18-gallon recycling bin for trade-in. Following the bin trade-ins, subscribers can take home a new roll cart or coordinate a roll cart home delivery with the Sanitation Department (delivery estimated at 10 business days.) Only cash or checks will be accepted at the event for payment of the $15 fee for the 65-gallon roll cart upgrade. Not able to make the two bin trade-in events in Dunwoody? Not to worry, subscribers can also trade-in existing 18-gallon bins in person at the Sanitation Division’s administrative office, 3720 Leroy Scott Drive, Decatur GA 30032. The 45th Annual Dunwoody Home Tour will be held on Wednesday, October 4, 2017 from 9:30 a.m to 3:00 p.m. Four outstanding private homes in Dunwoody and nearby Sandy Springs will be open to the public. 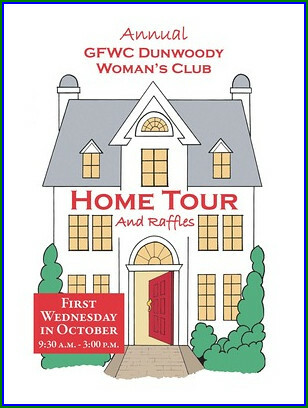 Tickets a location of the tour are available now at www.dunwoodywomansclub.com/home-tour/ or from any member of Dunwoody Woman's Club and at the following Dunwoody merchants: Blooms of Dunwoody, Consigning Women, Face Haven, Harry Norman Realtors, Southern Comfort Consignments, Jilli Boutique, Under the Pecan Tree, Lauderhills Fine Jewelry. Tickets are $25 in advance and $30 on the day of the tour. In addition to the homes, this year’s Dunwoody Home Tour will hold two raffles: one for a shopping spree at Lauderhills Jewelers and another for a decorative, one-of-a-kind wooden bowl handcrafted by Dunwoody artisan Dr. David Dalrymple. Raffle tickets will be available to tour guests on the day of the tour. All profits of the Home Tour and Raffles are used to implement the club's charitable initiatives.